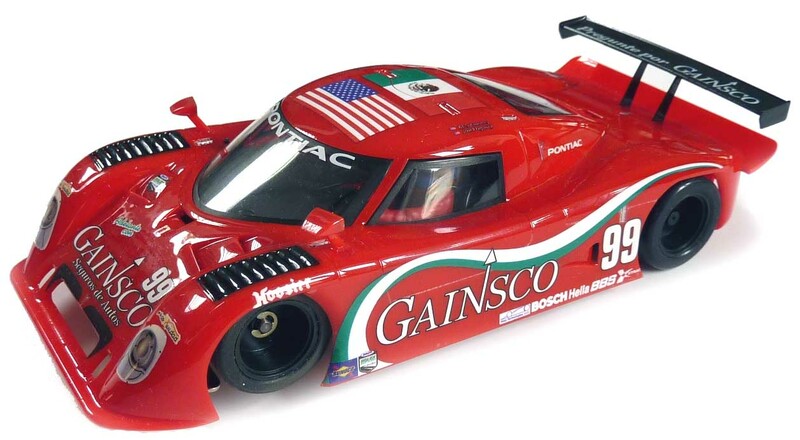 T32107S - 1/32 scale Gainsco-Pontiac GrandAm Champion [T32107S] - $159.95 : TSR Slot Cars, TSR Slot Cars - Dedicated to Slot Car racing, collecting, restoration, track design, electronics and software. This limited edition of the Alex Gurney/John Fogarty, Grand Am champion, is mounted over the fast and great-handling TSR chassis, now fitted with the superfast TD301 motor. This car should not be driven with the power set over 12-Volt as its speed is awesome and needs expert control. This car is fitted with the T32002HPS chassis and TSR-Ortmann Urethane compound tires for use on plastic tracks or routed wood tracks where no traction compound is being used, and a TSC25 guide pin for use on the better plastic tracks, Carrera, Revell, Monogram, Atlas, Fleischmann and Artin.